A happy hello to all of our readers from Puerto Plata on the north coast of the sun-splashed Dominican Republic. Our 2018 Silver Bank humpback whale season is moving ahead and the days are getting longer, minute by minute, a little more every week. Who wouldn’t be happy with a few extra minutes with the whales? Thanks for reading as I tell you about some of the great action from Week 9. 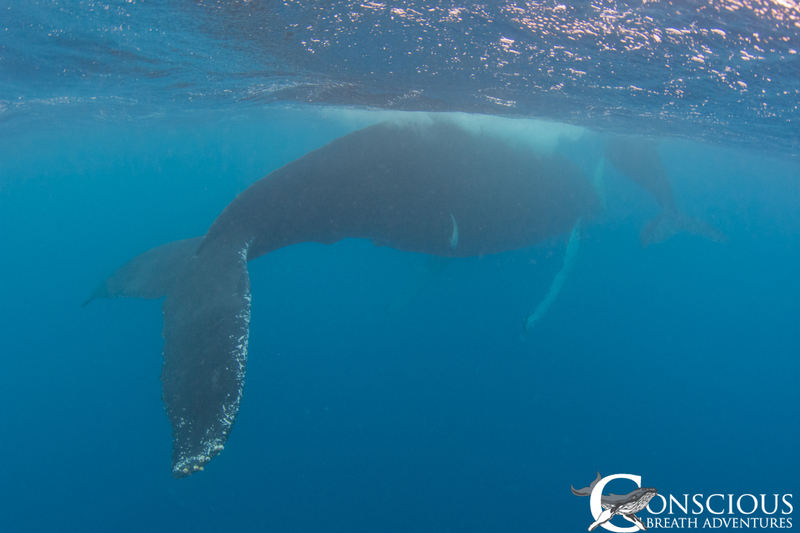 The excitement started from day one with a familiar duo, the same mother and calf from Week 8 that we swam with on Wednesday, and the same two whales featured in the captivating aerial footage from March 1 that I’ve shared with you before. This is a great momma to know and to find again! 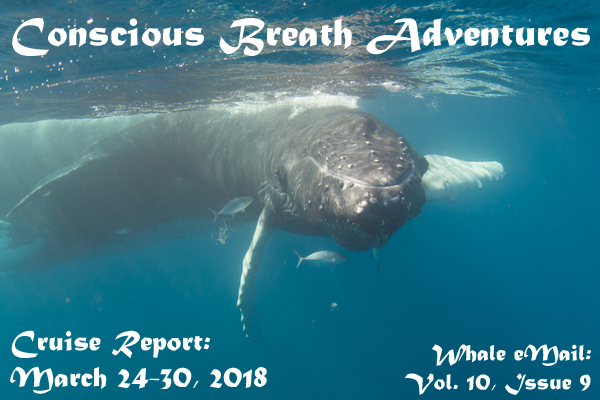 She has the most at-ease and relaxed disposition of just about any whale we’ve encountered this season, completely content to snooze at or near the surface for hours at a time, moving just a body length or two during each of her breath cycles. Her calf is a big one now, too, and mother is comfortable letting the calf wander farther afield to interact with our swimmers. 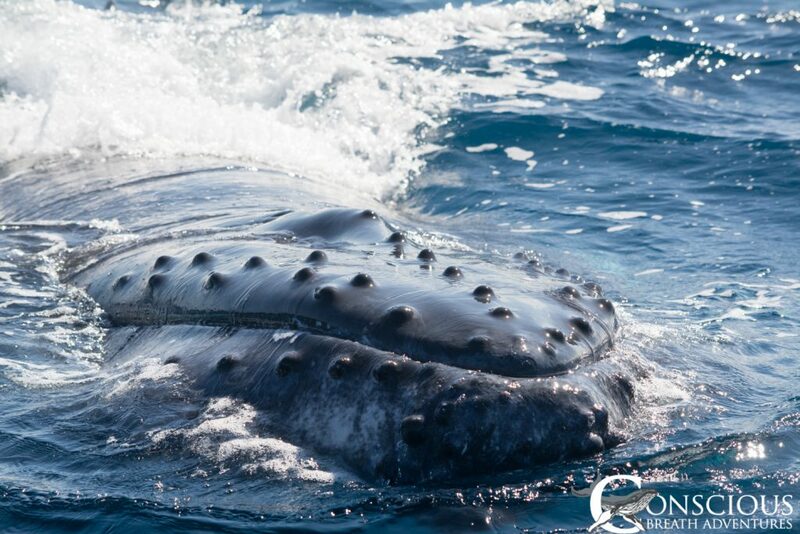 What more can be said except that spending an afternoon visiting the pair can’t help but fulfill every whale-swimming dream. 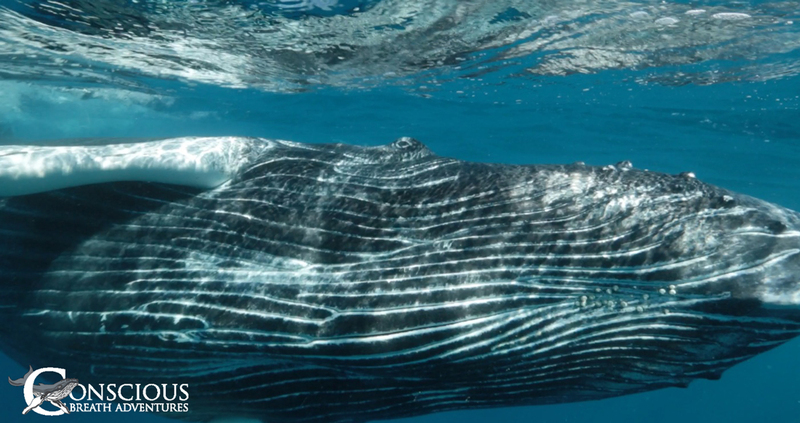 It is just amazing to think that here we are, seventy miles from land, hanging out with a couple whales just like loafing around with friends inyour living room at home. 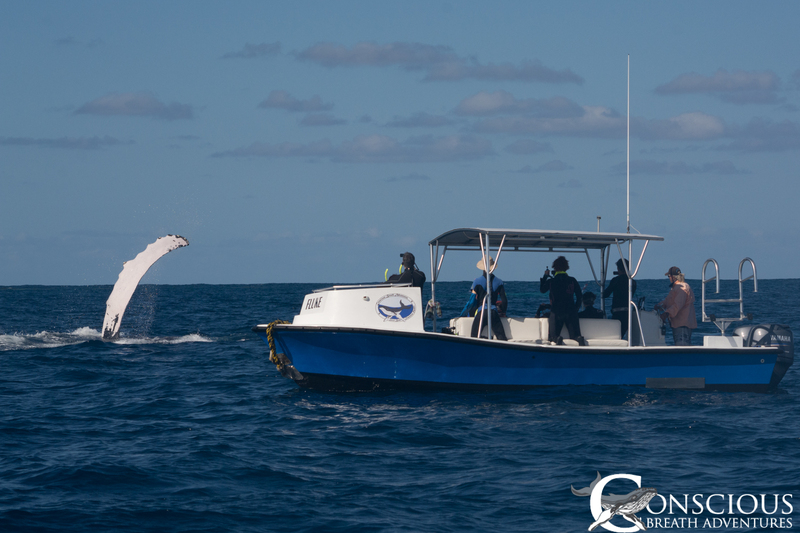 On another occasion our boat “Fluke” acme across a single young whale wandering the Silver Bank. From time to time we find these juvenile whales, which are not calves any more but are not quite old enough to be fully involved in the courtship and mating game just yet. We think of them as the bored and restless teenagers of the Bank, kicking around singly or in pairs, goofing off and playing around. 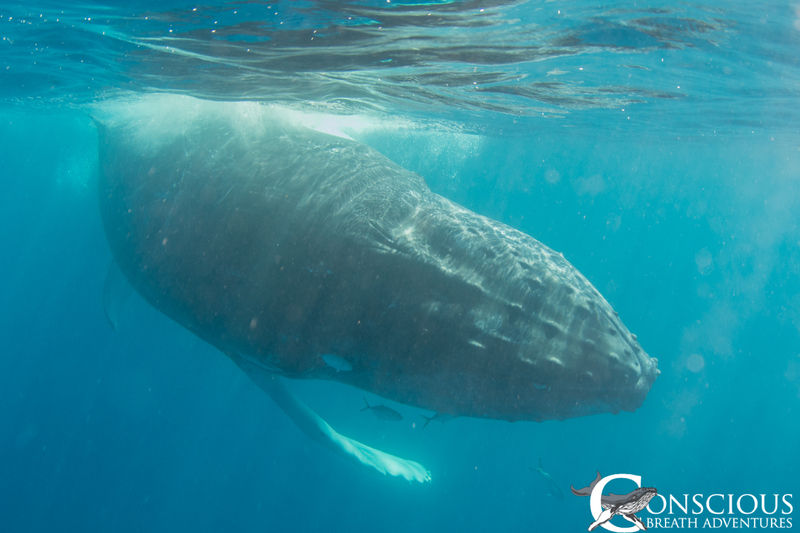 When we cross paths with these “juvies” they can be very curious and highly interactive with the boats but are usually indifferent or uninterested with swimmers in the water; we rarely try to swim with them. 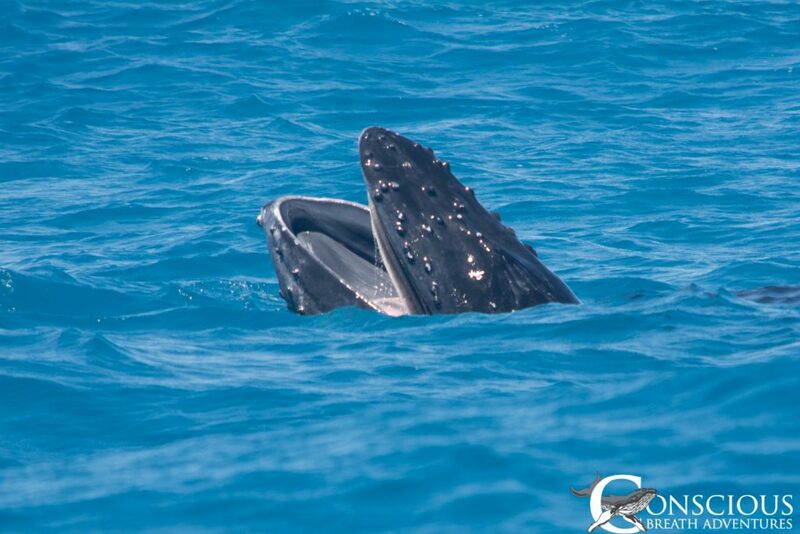 So it was with this whale which spent well over an hour diving down out of sight just to unexpectedly reappear minutes later, spyhopping just beside the boat as if trying to sneak up on our guests, or swimming directly beside and below, so close one could have reached out and touched it. Sometimes it would fire off some big surface behaviors like a peduncle throw or lobtail, as if to mix things up. Even without getting in the water it makes for a very exciting interaction. 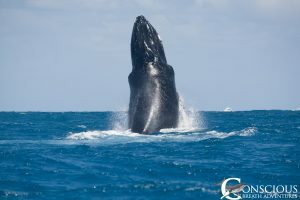 Other days offered a wide variety of behaviors including extended displays of pectoral fin slapping, lobtailing, peduncle throws and even the always-popular crowd-pleasing breaches, sometimes just yards from the boats. There were excellent opportunities for photographers, videographers and enthusiastic whale-watchers alike. Our last day of the week was one of our best, saving some of the best for last. In the morning all of our guests had a few exhilarating passes from one very playful and outgoing calf who would come so close you could count the barnacles growing on its chin. Mom shortly got a little tired of looking after her excitable baby and moved on leaving everyone laughing in their wake. 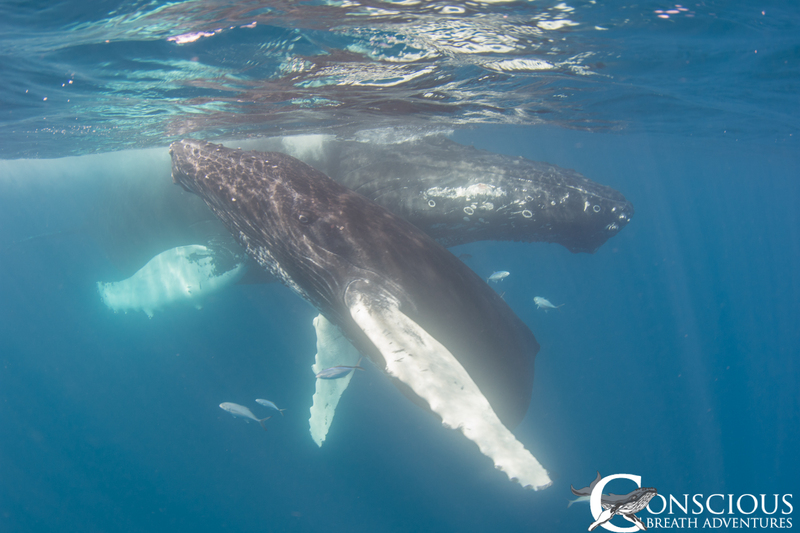 Later in the day one of our boats located a classic scenario, another mother and calf resting between the shallow coral heads in the reef. 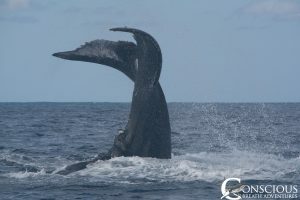 Mom was conked out, with a resting breath cycle of over twenty minutes, long for a mother with calf. 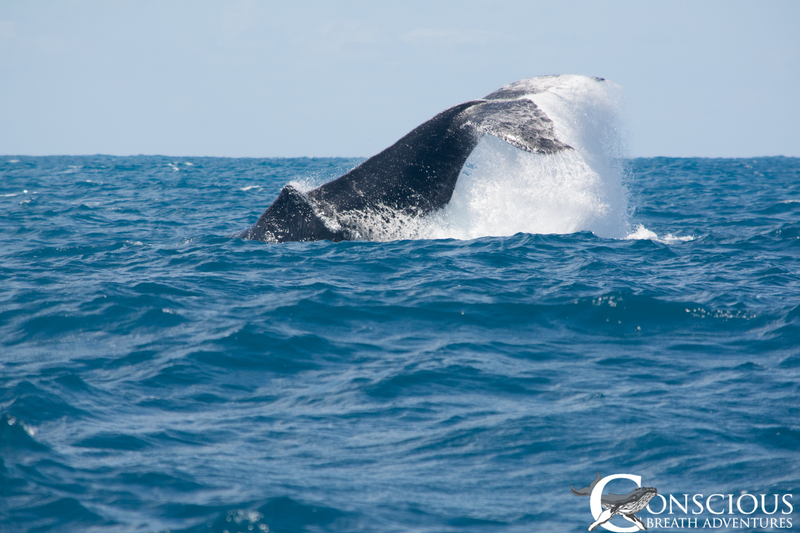 The calf was happy to play around while she napped, sometimes even circling the swimmers, an action of which most mother humpbacks disapprove. But this mom wasn’t bothered at all, allowing us all to spend the last hours of the day and week cavorting with her calf. What a great way to end a week!